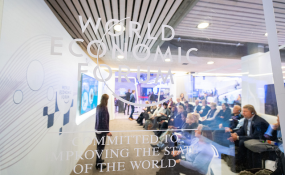 The World Economic Forum 2019. Berlin — Four of the top five most impactful threats in this year's World Economic Forum´s Global Risks report are related to climate change. The report warns that we are "sleepwalking to disaster" . But that is not true. As the global Fight Inequality alliance manifesto says: "We stand together to build a world of greater equality - where all people's rights are respected and fulfilled, a world of shared prosperity, opportunity and dignity, living within the planet's boundaries."